We found this place several years ago, unlikely enough only a few miles away from where my parents-in-law live near Osaka, and we've been back this year since it had left such a great impression on our first visit. The Hoshigaoka Sewing School must have been closed many years ago but it was then reopened with seemingly little funding as a community center a while back. Much of the grounds around the old school building have been left in a state of benevolent disrepair with only the most necessary repairs keeping the buildings intact. 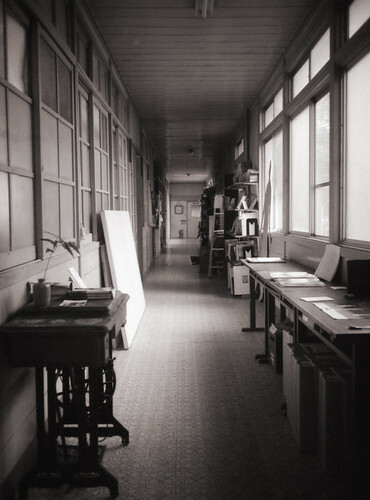 The main building now houses an art gallery and several of the class rooms are again being used for regular craft classes, the corridor in front of the class rooms filled with the detritus of many past projects. 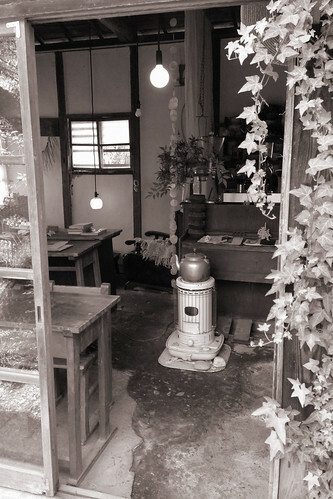 Behind the main building though is the secret attraction ofHoshigaoka - the Sewing Table Coffee House. 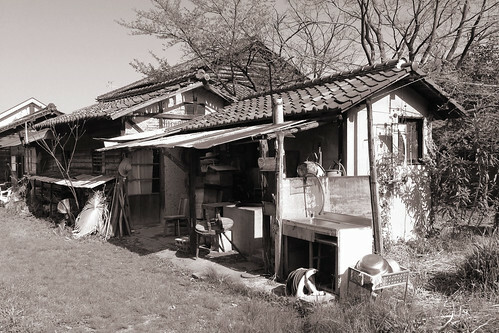 It occupies a small shed next to a pottery class room in a semi-abandoned backyard, surrounded by tall grass, with some small hand-built tables and rickety little stools to sit outside. Inside the cafe the atmosphere is calm and quiet, with a few tables and a counter at the window to sit, a table with art and books to look at and buy and the coffee counter where the owner of the cafe serves excellent coffee and cakes. 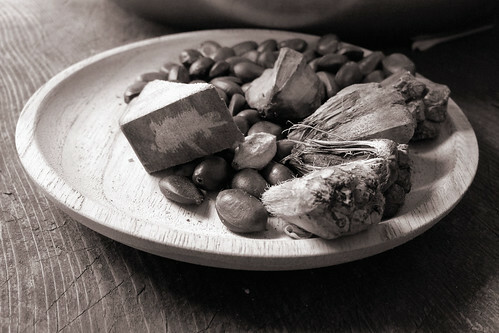 What made us come back was not just the great atmosphere and the coffee, but also the near endless photo opportunities. 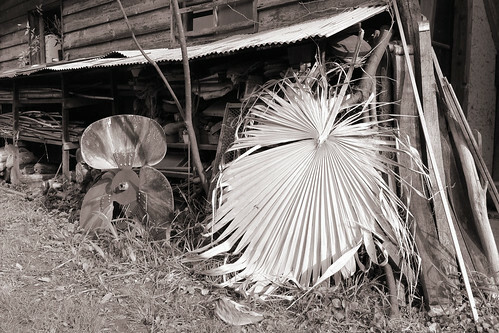 The buildings are filled inside and out with a wealth of objects of art and nature, with near-random piles of old, rusty tools next to stone sculptures, all overgrown with weeds and flowers. There are mossy goldfish ponds and wind chimes, artfully crafted lights next to bare light bulbs under spiderweb-encrusted ceiling beams. It's an endlessly fascinating place, a small island of tranquility in the far suburbs of busy Osaka that makes me want to come back for another visit every time I have to leave.